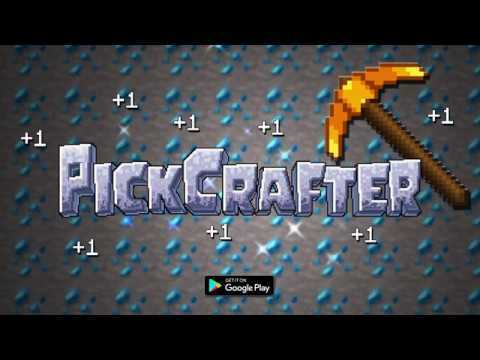 PickCrafter is the perfect incremental clicker idle game for fans of endless fun. Tap the day away digging for gold, diamonds, amethyst, and more! Find companions, and craft items to boost your PPS - get digging today! v4.19.1 - EGG HUNT EVENT!!! - Egg Hunt Event, Seasonal Goals, hidden easter egg locations! Thanks for playing and please let us know what you think! - Lucky Event, Seasonal Goals, PPS Items! - Badge System - can you get the Diamond Badge? - Skill - Voodoo Salvage! v4.18 - Prep for Lucky Event. Coming soon! v4.12.1 - 'Tis the HARVEST SEASON!!! - The oven (furnace) is coming back for crafting PIES, Dinners, and Feasts! - Frank the Pie boss! - 2 new pickaxes - Fork and Frank Pie-axe! - Special Limited Time offer! - Favorite Pickaxes using the new star ★ in Pickaxe Inventory - this will sort them to the top. - New Achievement added - One Shot Sono. - Bole difficulty has been tweaked. - Bug where mobs wouldn't spawn in early game. - You can tap through the Trophy pop-up thingy now. - Boss dialog secret codes won't show up multiple times anymore. - PAPA KLAWZ IS BACK! Help him defeat the Gingerbread-monz! - SnoMon building, too!!! New blocks and combinations ? - New Toys to find and craft during Winter! V4.14 - BRRRRR! WINTER EVENT IS HERE!!! - Bug fixes with the Loading Scene. - Fixing loading screen position for landscape mode. - Harvest event coming soon! - Bunch of Skills added to Skill Trees! SPOOKY EVENT IS STILL LIVE FOR A LIMITED TIME!!! - Furnace will now remember your last craft! v4.10 - IT'S SPOOKY SEASON!!! - Special Spooky Pumpkin Queen Adalae is here for a limited time! - New Pickaxes: Adalae's Broom and Enderium! - Crafting Spooky Candy in the Cauldron is back! - Pumpkin Chests are back, too! Thanks and please let us know what you think! Meatloaf's Party! Limited time only! - 2 New Pickaxes - Birthday Cake & Present Pickaxes! - Upgrade special pickaxes with picks - this was a suggestion from the community! Boss Rush Event! LIMITED TIME!!! - 2 New Bosses: Sono and Chronos! - 2 New Pickaxes - Sono-Chron & Anti-Sono pickaxes! - Paper Pete the pencil-slinger has rode into Runaria! Try your hand in an epic stand off against Paper Pete! Thanks for playing - please be sure to review the game and let us know what you think! - Rue the Runic Fairy and her Magical Marvelous Machine has arrived! Check the Player Shield menu to find her. - New boss will arrive in Runaria! • New Super Doggo Snack Time Boss! • New PPS Boost! Check out the Boost Dial on the top of the screen to try the new optional PPS boost! • 3 New Pickaxes! Doggo, Wonder Fizz and Palladium! • Turkish and Indonesian languages added. • New PPS Boost! Check out the Boost Dial on the top of the screen to try the new optional boost! • 2 New Pickaxes! Wonder Fizz and Palladium! Follow @PickCrafterGame for the latest announcements. Thanks for playing - please check out the game and let us know what you think! • Seasonal egg hunt chests, resources, and gear - available for a limited time! Changes:• Fix for Pot of Gold Pickaxe from not exploding blocks• Tumbleweed Pickaxe can be crafted with Tumbleweed• Bug fixes for upcoming Lucky Event!• Fixed bug where Furnace wasn’t working offline• You can now upgrade Pickaxes multiple levels with one buttonFollow @PickCrafterGame for the latest announcements.Join our Discord: https://discord.gg/pickcrafterThanks for playing - please be sure to review the game and let us know what you think! The Boss Update! !Features:• Boss battles! Summon epic bosses, earn loot & trophies, and compete on new leaderboards!• Three new pickaxes! Find the Solar & Lunar pickaxes in chests and discover the mysterious link between them.• Tap and hold is now available for all pickaxes!Follow @PickCrafterGame for the latest announcements.Join our Discord: https://discord.gg/pickcrafterThanks for playing - please be sure to review the game and let us know what you think! 3.8.4 Update!• Bug fixes regarding new player tutorialThe Mythical Update! !Features:• New ways to spend Picks! Buy common blocks in each biome using picks... you can even earn chests!• New Mythical blocks and epic Mythical machines available in the Store!Balance:• Biome costs have been tweaked• Prestige now costs picksFixes:• Language/translation supportJoin our Discord: https://discord.gg/pickcrafterThanks for playing - please review the game and let us know what you think! The Mythical Update! !Features:• New ways to spend Picks! Buy common blocks in each biome using picks... you can even earn chests!• New Mythical blocks and epic Mythical machines available in the Store!• New TutorialsBalance:• Biome costs have been tweaked• Prestige now costs picksFixes:• Language/translation support• Additional bug fixesJoin our Discord: https://discord.gg/pickcrafterThanks for playing - please be sure to review the game and let us know what you think! V3.7.5 Update!- Firework Pickaxe is now available in Winter Chests! :)V3.7 - Winter Update!• The Winter Event is now live with new exclusive Pickaxes, Chests, and Gear!• Meet Papa Klawz! Do you wanna build a SnoMon?• Daily reward expanded!• Support for more languages added (Russian, Polish, German, French, Hungarian)Join our Discord: https://discord.gg/pickcrafterThanks for playing - please be sure to review the game and let us know what you think! V3.7.4 Update!- Prepping Fireworks Pickaxe - who is ready :)- Fixed a minor bug with Elite Runic AwardingV3.7 - Winter Update!• The Winter Event is now live with new exclusive Pickaxes, Chests, and Gear!• Meet Papa Klawz! Do you wanna build a SnoMon?• Daily reward expanded!• Support for more languages added (Russian, Polish, German, French, Hungarian)Join our Discord: https://discord.gg/pickcrafterThanks for playing - please be sure to review the game and let us know what you think! V3.7.2 Update!- Fixed issue regarding Elite bonus- SpinWheel tuning, adding in Hungarian LanguageV3.7 - Winter Update!• The Winter Event is now live with new exclusive Pickaxes, Chests, and Gear!• Meet Papa Klawz! Do you wanna build a SnoMon?• Daily reward expanded!• Support for more languages added (Russian, Polish, German, French, Hungarian)Join our Discord: https://discord.gg/pickcrafterThanks for playing - please be sure to review the game and let us know what you think! V3.7.1 Update!- Fixed SnoMon Runic awards not crediting properly- Decreased cost of Eye of GorgonzolaV3.7 - Winter Update!• The Winter Event is now live with new exclusive Pickaxes, Chests, and Gear!• Meet Papa Klawz! Do you wanna build a SnoMon?• Daily reward expanded!• Support for more languages added (Russian, Polish, German, French, Hungarian)Join our Discord: https://discord.gg/pickcrafterThanks for playing - please be sure to review the game and let us know what you think! V3.7 - Winter Update!• The Winter Event is now live with new exclusive Pickaxes, Chests, and Gear!• Meet Papa Klawz! Do you wanna build a SnoMon?• Daily reward expanded!• Biome unlocks now scale up with each prestige• Minor balance changes on some ability stats• Support for more languages added (Russian, Polish, German, French, Hungarian)Join our Discord: https://discord.gg/pickcrafterThanks for playing - please be sure to review the game and let us know what you think! V3.5.3 - Harvest Update!• The Harvest event is now live with new exclusive Pickaxes, Chests, and Gear!• Furnace boosting to the moon! Roll a boost beyond 2x• More bug fixesV3 Epic Update - The largest update since release!• New Biomes, Pickaxes, Chests, Abilities, Prestige, and Abilities added!• New Features: Furnace, Skill Tree, ArtifactsFollow @PickCrafterGame for the latest announcements.Thanks for playing - please be sure to review the game and let us know what you think! V3.5.2 - Harvest Update!• The Harvest event is now live with new exclusive Pickaxes, Chests, and Gear!• Furnace boosting to the moon! Roll a boost beyond 2x• More bug fixesV3 Epic Update - The largest update since release!• New Biomes, Pickaxes, Chests, Abilities, Prestige, and Abilities added!• New Features: Furnace, Skill Tree, ArtifactsFollow @PickCrafterGame for the latest announcements.Thanks for playing - please be sure to review the game and let us know what you think! V3.5.1 - Harvest Update!• The Harvest event is now live with new exclusive Pickaxes, Chests, and Gear!• Furnace boosting to the moon! Roll a boost beyond 2x• Additional bug fixesV3 Epic Update - The largest update since release!• New Biomes, Pickaxes, Chests, Abilities, Prestige, and Abilities added!• New Features: Furnace, Skill Tree, ArtifactsFollow @PickCrafterGame for the latest announcements.Thanks for playing - please be sure to review the game and let us know what you think! V3.5 - Harvest Update!• The Harvest event is now live with new exclusive Pickaxes, Chests, and Gear!• Additional bug fixes and performance improvementsV3 Epic Update - The largest update since release!• New Biomes, Pickaxes, Chests, Abilities, Prestige, and Abilities added!• New Features: Furnace, Skill Tree, ArtifactsFollow @PickCrafterGame for the latest announcements.Thanks for playing - please be sure to review the game and let us know what you think! V3.4.1 - New Pickaxes!• New Pickaxes: The RockShield Pickaxe and Sono's Pickaxe are finally here!• Additional bug fixes and performance improvementsV3 Epic Update - The largest update since release!• New Biomes, Pickaxes, Chests, Abilities, Prestige, and Abilities added!• New Features: Furnace, Skill Tree, ArtifactsFollow @PickCrafterGame for the latest announcements.Thanks for playing - please be sure to review the game and let us know what you think! V3.1.1⛏ Balance changes⛏ Many bug fixesV3 Epic Update - The largest update since release!⛏ New Biomes added to the map⛏ Tons of new Pickaxes⛏ Chests overhauled⛏ Prestige system remodeled⛏ Abilities redesigned⛏ New Feature: Furnace⛏ New Feature: Skill Tree⛏ New Feature: Artifacts⛏ Performance improvements and bug fixesFollow @PickCrafterGame for the latest announcements.Thanks for playing - please be sure to review the game and let us know what you think! V3.1⛏ Idle Hopper has been buffed⛏ Many bug fixesV3 Epic Update - The largest update since release!⛏ New Biomes added to the map⛏ Tons of new Pickaxes⛏ Chests overhauled⛏ Prestige system remodeled⛏ Abilities redesigned⛏ New Feature: Furnace⛏ New Feature: Skill Tree⛏ New Feature: Artifacts⛏ Performance improvements and bug fixesFollow @PickCrafterGame for the latest announcements.Thanks for playing - please be sure to review the game and let us know what you think! Largest update since release!! !⛏ New Biomes added to the map⛏ Tons of new Pickaxes⛏ Chests overhauled⛏ Prestige system remodeled⛏ Abilities redesigned⛏ New Feature: Furnace⛏ New Feature: Skill Tree⛏ New Feature: Artifacts⛏ Added Achievements⛏ Performance improvements and bug fixesFollow @PickCrafterGame for the latest announcements.Thanks for playing - please be sure to review the game and let us know what you think! Version 2.24!- Minor performance improvements and bug fixes.Stay tuned, a huge update is in the works for PickCrafter! Follow @PickCrafterGame for announcements.Thanks for playing - please be sure to review the game and let us know what you think! Version 2.23!- Performance improvements, bug fixes, and a new battery saving option in the Settings menuThanks for playing - please be sure to review the game and let us know what you think!